a. The ultimate stress is the ratio of maximum load to the original cross-sectional area. c. Shear strain is a measure of angle in radians through which the body is distorted by the applied load. d. A beam having more than two supports is known as over hanging beam. e. If a vertical pilla is subjected to an eccentric loading the only stress produced is bending stress. j. Strength of a column depends upon its ______ ratio. c. Buckling load and safe working load. d. Perfect frame and deficient framed structures. 3. Find the moment of inertia of a L-section 100 x 120x 15 mm about x-x axis and y-y axis passing through the centric. 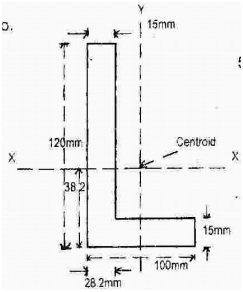 Calculate also redius of gyration about both the axes provided the centroid lies at 38.2 mm from base and at 28.8 mm from left hand edge of the section. 4. A square R.C.C column 400 mm x 400 mm carries load of 1500 KN. Taking of elasticity in concrete and steel as 14x103 N/mm2 and 2.1 x 105 N/mm2 respectively , and the column consists of 8 No 20 mm dia. Bars. Find compressive stress in concrete and steel. 6. Find the width and depth of a timber beam of rectangular section. Which can safely carry a u.d.i. of 15.2 KN/m over a span of 10m. the max. permissible stress is limited of 8MN/M2 provided the width of the beam is half of its depth. 7. Find the safe compressive load on a hollow cast iron column whose one end is pin jointed and the other rigidly fixed. The outer diameter is 150mm and inner dia. 100mm and height of the column is 10 m take E=9.5 x 10 4 MN/ m2 and sue Euler’s formula with a factor of safety factor of 5.